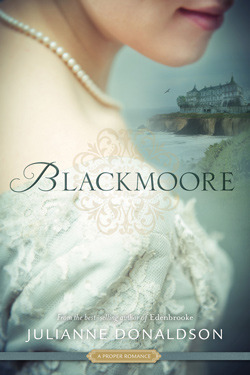 I loved Edenbrooke so much that I knew I needed to read Blackmoore immediately. I was not disappointed. Not in the least. I loved it so much I re-read it immediately after I finished--unable to continue on to anything else in my life. I needed this story again. This story is dark and sad. Yet, is filled with hope and the romance is smouldering. There were moments between Kate and Henry that literally look my breath away. Moments that brought tears to my eyes, more like sobs, and moments that made me scream out, "why?!!" I felt it all. I was so invested in the story and the character's that I literally could not stop reading. I tried to set the book down and I just couldn't. I didn't want to. My heart needed to know what happened next. Kate is such a complex character and she has all these hidden secrets that make up why she is the way she is. Her love is so steadfast and she is selfless. I'm in awe of her character and was full of hope for her the whole book. Henry Delafield is my kind of man. He is the stuff my dreams are made of. No question. There were moments between he and Kate that actually had me holding my breath. There were moments where my whole body got tingly and my chest felt like it was going to explode. He is a dreamboat and oh so kind. I can't get enough of Henry. I'm telling you that I've not read a book I liked this much in so long. I've been stuck in a mediocre reading rut for so long. It is as if Blackmoore has thrown me a life vest and I'm hanging on for dear life. I'm entertaining the idea of reading it a third time this week. I don't want to move on from this story. I just can't. I'm not ready. I'm putting it on my all time favourites list. It deserves the spot. If author Julianne Donaldson had any more books, I would buy them all without even knowing what they were about. I totally trust her as an author. "Kate," he whispered, stepping closer to me, "you are not like your mother. You are a different creature from your sisters. The depths of your soul are fathomless. You are brave and loyal and true. You have such a good heart." he held my hand close to his chest and covered it with his other hand. "It is only afraid. But I would take such good care of it, love, if you would give it to me." He bent his head and pressed his lips to my fingers." Not an author I am familiar with but after your glowing review I will check her out. I just love when you get a book that lifts you like this one has done for yourself, do you find you go and seek out all of their other books?